Ever since coming to power, the NDA has announced many new mega plans as well as fast-tracked many existing plans. Digital India, Make in India and Smart Cities are among the new initiatives, while some others such as the financial inclusion programme and direct benefit transfer (DBT) have been fast tracked, in some cases with rebranding (as in jan dhan yojana). Many of these programmes are not about doing new things; they are about doing things in a new way. Take Digital India, for example. It is about achieving the same governance objectives – better health, better education, hassle-free government services and so on – more effectively by leveraging technology, internet and mobile. Many of the immediately visible changes are often on the citizen-facing side or the services provided by government departments and agencies. Tax authorities (finance ministry) collect taxes, issue challans and process filings; passport offices (external affairs ministry) issues passports; urban local bodies provide and manage public services; the election commission registers voters and issues voter ID cards; transport authorities issue driving licences. These are all citizen touch points. Traditionally, many of these have been citizen pain points. The prime objective behind e-governance and the national mission mode services or Digital India is to change that; and make these services smoother. Digital is just a means that helps directly (by allowing the citizens to do many things from their drawing rooms) and indirectly (by making information flow between departments and units faster) achieve these objectives. While the main purpose is to provide more effective citizen services, use of technology often results in significant efficiency gains by default. That often is its nemesis. The efficiency gains over old physical processes are so much that it’s often forgotten that further efficiency gains are possible if it is done properly. This is not surprising. When a new technology or invention comes, people tend to use it just as a replacement for the older system – exactly in the same manner as they used the older system, of course, with gains in a single dimension. The capability of a new medium or technology is rarely fully utilised. This is exactly what is happening with the digitisation of government services. Imagine each of these services – like issue of passports or applying for a PAN card – as a process consisting of a series of specific tasks. While the objectives and the flow of these processes are different, many of the individual components (tasks) are similar. Take payments, for instance. 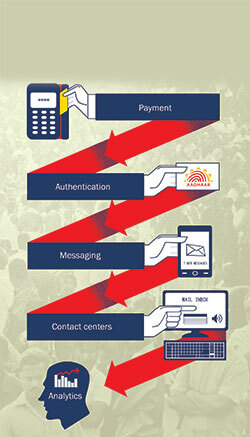 Many of the government services require the citizens to make some payment. Or take authentication. Almost everything that you do on a digital medium such as internet or mobile, you have to authenticate yourself. How does this happen today? Every service has its own dedicated portal/application that integrates everything – payment, authentication, some sort of communications, sometimes its own customer services interface – and collects its own data at the backend, stores them and analyses them. Now, these tasks in each of these processes are not just similar; they are the same. How is the payment for PAN card different from paying for viewing a document in corporate affairs ministry website? You use similar choice of payment methods – bank account, credit card, debit card, etc. – and complete the transaction. But what happens today? Each of these is separately handled for each service. Sometimes even within the same ministry, there are different systems – either in-house or outsourced – for different department and even different services within the same department! So, what is the problem? Many. One, it is inefficient to duplicate infrastructure and resources in silos and not using them optimally. Two, these small standalone systems not just bring in sub-optimal utilisation of resources and infrastructure, they bring in huge operational inefficiency. That is because smaller standard services issues demand more time from specialist workforce, who may not be well-suited for handling those while it eats into their time to do their core jobs. Three, this approach gives non-standard experience to the users (citizens). Every time, they have to learn a new process to authenticate, pay or file their complaints. Finally, there is something that brings in far bigger issues in the long run: the issue of governance. Smaller specialist teams do not have the wherewithal to handle governance issues. While there are many such issues, one that is obvious is the classic inefficiency to do effective outsourcing. Many of the functions – right from website maintenance to content management; technical support to query handling – are low value but specialist jobs and are usually outsourced. Now, how can a small team ensure that the desired results accrue from that outsourcing? They hardly know how to create a service level agreement (SLA) or how to measure the performance of a citizen query handling system. Very often, that results in bad outsourcing and wastage of taxpayers’ money. In the earlier physical system regime, it was natural to have completely independent vertically-integrated service provision. In the technology regime, that would be hugely inefficient. As the PM says, we need to have a shared vision for a powerful India. So, why not a shared approach to deliver government services? I am talking of a model where common and similar tasks can be centralised to take advantage of scale and effective governance, while the core teams concentrate on their core jobs. Now, this is not a new idea. Large, diversified business organisations which have multiple businesses have already faced similar issues and have discovered a solution. And it is not even new. Called shared services approach, they centralise routine tasks which may be part of core processes too but where efficiency and not domain knowledge is the driving factor. In mature organisations, it is these shared service centres that, in consultation with the process owners – the business teams and here the individual services owners such as passport office – who even take outsourcing decisions. Being specialised teams they know how to do it well. The vendor selection, SLA creation and SLA management are handled by them. This is not a new idea for the government too. NIC, launched decades back, has done precisely the same for central and state governments as far as their IT and website requirements are concerned. With the processes being digitalised, it is possible to do that with business processes as well. This is exactly the path large firms followed. Minimum government is not just about having fewer ministers; it is about optimising resources and infrastructure as well. While this article gives the example of the centralised shared services of large corporations to make its point, this in no way should be considered as advocating replicating the same model for government services in India. That is because even this approach was worked out one and a half decades back. In terms of technology, many things have changed since then. What is needed is a conscious thinking that there should be a continuous and consistent striving for enhancing efficiency as newer technology-based solutions are rolled out. It is possible in each of the cases and just a belief that this can be achieved will show many ways to do that. Similarly, sharing of resources and infrastructure as a philosophy is critical. This can be done by taking ground realities and environmental factors into considerations. For example, when these large shared services journeys in global corporations began, there was no concept of cloud. Today, that sharing can be done far more efficiently and smoothly on a cloud platform. The cloud model provides an excellent balance between optimisation of resources and flexibility to individual services owners. It achieves the same efficiency without forcing centrally-dictated one solution on departments and agencies. While the governance part needs to be standardised, the individual process owners can have their choice and flexibility as far as solution and implementations go. As many government departments move to a cloud – may be a ‘private’ cloud created by the government – there can be managed apps platforms like AppExchange that will give the users choice of selecting their own preferred apps. Who knows, in time, the government can even crowdsource those solutions, the same way it has started crowdsourcing ideas?